The Washington Legislature recently took action to change our state’s wholesale vehicle dealer license law to stop out-of-state businesses with no connection to Washington from obtaining licenses to conduct vehicle dealer business outside of our state. The primary changes to this law include requiring wholesale vehicle dealers to only buy vehicles from, and sell to, other Washington state licensed vehicle dealers. It also prohibits more than three wholesale vehicle dealers from sharing a single business location. Recently, there has been an 800 percent increase in the monthly number of wholesale vehicle dealer licensing applications submitted to the Department of Licensing. These applications are submitted on behalf of out-of-state individuals by Internet-based companies. These companies advertise the service of taking care of all of the paperwork necessary to set up a Washington business and obtain a Washington wholesale dealer license on behalf of their clients. As a result, these out-of-state business owners are all located at a handful of addresses in our state including a single address in the small town of Wilbur in Eastern Washington used by more than 300 wholesale vehicle dealers as their place of business. Because these out-of-state wholesale dealers are not located in Washington or doing business here, it is impossible for the Department of Licensing to monitor, investigate or regulate these businesses. Our state’s wholesale vehicle dealer license law is set up to provide a lot of operational flexibility to companies that only sell buy and sell vehicles at dealer-only auctions or directly to other vehicle dealers. Dealers with this type of license are prohibited from selling vehicles directly to consumers. However, individuals across the country have been taking advantage of our flexible laws and obtaining these licenses in our state with no intention of doing business here. Other office buildings in Moses Lake, Everett and Spokane Valley also are set up in a similar way to house out-of-state wholesale dealers who are, on paper at least, located together. There is no evidence that any of the hundreds of wholesale dealers have ever stepped foot in any of these facilities. Instead, they pay monthly rent to the owners of these Internet companies and receive mail forwarding services. This new law (ESSB 6606) takes effect immediately and the Department of Licensing will soon begin notifying current wholesale vehicle dealer licensees of the new requirements. Interested in landscape architecture and don’t have a family or business connection with the industry? Here’s your chance. The landscape architecht board has a vacancy for its public member position. The public member provides an important perspective: they offer a view that is sometimes difficult to see as a member of the profession and they advocate for the public as a whole. The Landscape Architect Board examines candidates for licensure, holds disciplinary hearings, and recommends adoption of rules and regulations. The board meets 4 times a year and members serve 6-year terms. They’re entitled to reimbursement for their travel expenses and receive a small stipend as compensation for their service. For complete information about this governor-appointed position and application process, click here. If you‘re hiring a limo or town car for a prom or another special event, make sure you’re riding safely and in style. Washington has a lot of licensed limousine companies to choose from. Before hiring one, make sure the limo and the driver are properly licensed by the state. To find out if the limousine service you plan to use is licensed, visit the Department of Licensing website at www.dol.wa.gov or call 360-664-1414. If a person or business has a professional license. If a business is licensed with a city or the state. If your business or professional license is active. When a business or professional license will expire. You can search by name, license number, type of license or location. The search will only provide information about business and professional licenses issued by the Department of Licensing. 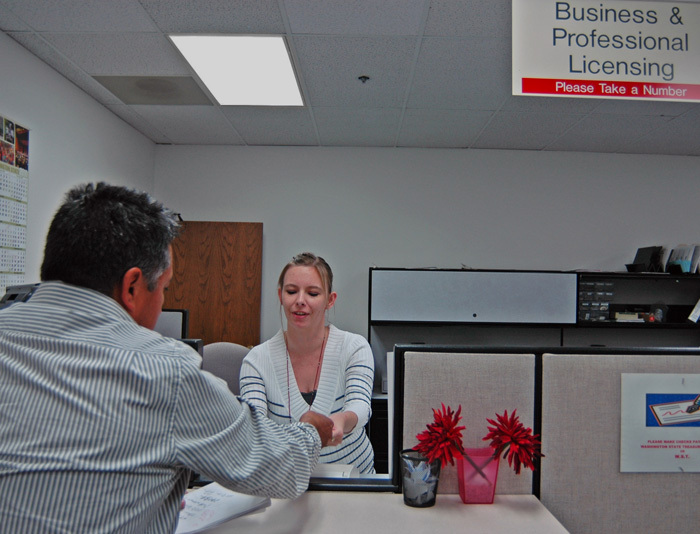 For information about licenses issued by other agencies, visit the list of licenses. Click here to watch our YouTube video about our license lookup system. Considering a short sale of your property? Make an informed decision. The economic challenges that so many are facing have resulted in many homeowners needing to sell, but owing more on their home than the home is worth. A short sale is a real estate transaction where the sales price is insufficient to pay the debt and obligations on the property along with the costs of sale, and the seller is unable to pay the difference. Every short sale is dependent upon the seller’s lender agreeing to the transaction and agreeing to release the lender’s interest in exchange for less than what is owed. In some cases however, the lender’s approval of a short sale does not necessarily mean the lender relieves the seller of liability for repayment of the entire debt. A short sale is a very complex transaction that involves numerous issues as well as legal and financial risks. Information on our website addresses some of these issues and risks, but isn’t necessarily fully comprehensive. You should always get the advice of a lawyer and tax professional before proceeding with a short sale. You are currently browsing the archives for the Business licensing category.